I couldn't ask for any clearer. There's only one component that I can't read the numbers, a little rectangular one just above and to the right of the round antenna pin in the center. But the LNA/filter parts would probably have to be unsoldered and measured to exactly duplicate that part. That's not the problem, I could generate a set of schematics and gerbers for it if I had one to take apart. The problem is moral, legal, ethical, whatever you want to call it. Reversing it for personal use is probably OK but the least restrictive the board license is is probably still non-commercial use only like the revo, oplink, and other boards that we have original schematics for. I think only the cc3d had a true open hardware license that allowed commercial duplication. Unless someone changed to license from non-commercial use I don't even think the revo and oplink copies are truly legitimate. That said, if I had one, even an intact but non-working one, I'd regenerate the schematic and gerbers so people could homebrew their own. Someone would have to donate one knowing they'd never get it back. A better solution would be to lay out a new board using either the same 7 series module or the newer 8 series ublox module and just make it software compatible with the current board. That would avoid any question about the licensing of the board. I've considered doing that, these days the hardware is easier than debugging the firmware. But who's going to build them? I might hand build a couple for myself but I don't want to get into building and selling hardware. And I could be wrong but I haven't seen anything that would make me think the project itself wants to get into building hardware. 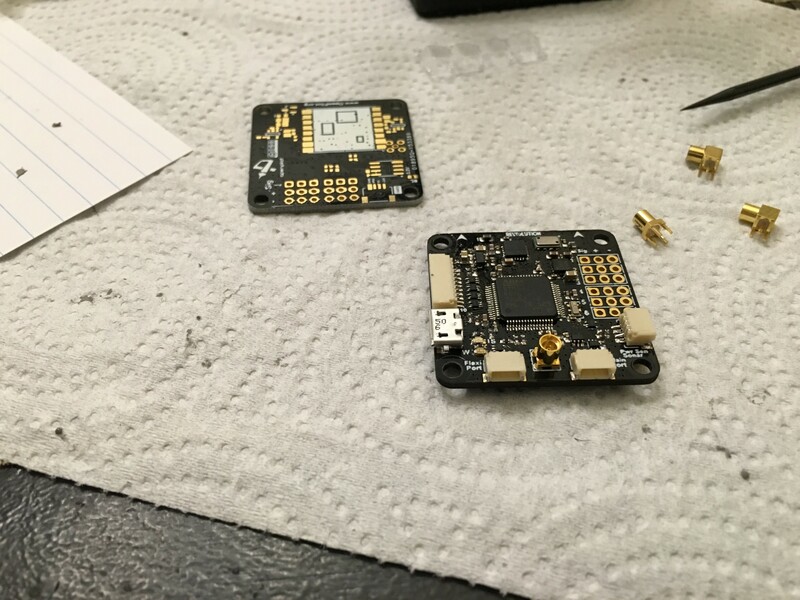 And cost is also a consideration, in the US and Europe the parts to build one are way more than what we can buy the complete boards from China with separate gps and mag wires. That's why I started working on a combiner board that will take one of those boards and make it look to the FC like an actual V9. The rest of the parts I need to develop this should be here in a week or so. By early to mid January I should be ready to order blank PCBs. I'm not sure whether or not I actually want to build and sell them but I was intending to make the design fully open source / open hardware so anyone can build their own once I get my own prototypes working properly. If I'm correct the chip you are referring to is the one with the reflective lettering. I took a closer look and it says. "ATH3". Also I think your idea is much better taking into consideration the legal implications of being caught infringing someone else's hardware. In addition a GPS unit similar to the v9 but with a m8n module would be much better in the end. If you do go through with this be sure to follow up id love to get hold of your gerber and BOM lists to assemble one myself.. I've already built a 2x revo's from components and excluding the price of having high Tg/Td ENIG PCB's fabbed up, components alone from digikey and sparkfun came out to be just under $90 So I understand the costs of something like this. To find someone who can produce such a V9 derivate/copter/ rebuild how ever you want to call... Should be no problem we have done that before but it will be very expensive. Maybe drotek is interestet in this Technologie? Drotek makes some great GPS's. I've had a few of their 6M's, 7N's and M8N's. Maybe someone should shoot them a message letting them know that something that can send mag data over the same 4pin jst connector is demand. So hurry up write drotek an email ;-) someone with better skills than me and an idea of what we need should get in contact with them. Thats the problem lol I know absolutely nothing about how the V9 works... Thats something I think someone like hwh would be better off explaining lol. It could be something like that. The two halves of the picture seem to be of different revisions of the board. On the left the board is designed for an external active antenna and on the right it shows a passive patch antenna mounted. Most of the changes seem to be designed to lower cost and ease hand assembly and wouldn't affect performance. I'm not sure what the performance difference between the external active antenna and the existing passive patch with LNA/SAW filter is. I suspect they would be similar. It would be interesting to test the two side by side and see. There is already a thread around here somewhere that discusses the DJI GPS/mag hardware. They are only $26 shipped. I have one on order to see how easy it would be to support. I think this type of GPS/mag looks to be a real winner for us. The descriptions are identical but the logo on the pictures is different. I found the one I ordered on banggood and although their description is identical to the auctions, including the 32 bit cpu, they show a picture of the inside that clearly has an Atmel Mega328p, an 8 bit cpu. Other pictures on the web show one with a STM32F030F4P6. I'm hoping that I get the one with the Atmel chip and you get the STM32 one so we'll have firmware written for whichever one someone receives. I hope to go one better than that. These both use the DJI protocol. It would be a lot easier to make the FC grok DJI GPS/mag. No GPS/mag flashing needed for that, no matter what processor they use in the GPS/mag. That doesn't seem like as much fun as tearing apart the gps units, reverse engineering them, and modifying them. But it does make a lot more sense than my way and is way, way easier on the end user. yes, I just design this to have a try. it is a prototype. will use NEO-M8N, active antenna, rechargeable backup battery, the bottom side's passive antenna is just used to show as a 3D model. all RLC use 0603 size. and if all goes well, I will assemble a prototype at the next weekend. First, before anyone goes out and buys one, DON'T. They don't work with anything other than NAZA flight controllers. I ordered one to look at modifying the firmware in them to work with my revo and TheOtherCliff ordered one to look at changing the LP software to read the protocol they put out. Currently you can't use one even if you change the connector. The one I received is, as I hoped, the Atmel based one. It's essentially an Arduino mini with a ublox Neo-M8N gps module and a mag sensor. It's running an unmodified version of Pawelsky's adapter code that was written to emulate a real Naza gps. The hardware is nicely done, a clean design and well constructed. Unlike many of the inexpensive gps units available it has an external LNA and SAW filter on the gps and in theory should have performance similar to the V9 gps. Maybe better since it has a newer generation Ublox module. I hooked it up to a usb-serial adapter and confirmed that it works. The firmware is hardcoded to 115,200 baud and it puts out Naza protocol packets. It looks like about 4 or 5 gps packets a second and a lot more mag packets between them. Probably 50 or so a second? Even though TheOtherCliff's way of modifying the system to read this protocol is the best solution for most users I'm going to continue to work on replacement firmware that emulates the V9. While most people probably wouldn't have the stuff around to install replacement firmware I think that if I release V9 emulation firmware for it the Chinese makers will probably produce and sell a version with that firmware and our JST-SH connectors. At least I hope so. I will begin with researching DJI protocol. Google says it is well documented and 100% serial so it should be a very short time to implement.